Other times they are (seemingly) SO BIG that they crush your ability to feel like you can accomplish ANYTHING, or even feel like you can breathe properly. Which really... is NOT true. Don't let yourself believe that. But it is hard to when you have what seems to be a 666 lb snarling demon sitting on your shoulders slavering filth and bad feelings all over you keeping you mired down in the dreary dregs of despair. This past weekend I ran the Tushars 93k race - the final event in the Grand Circle Trail Series put on by the amazing RD Matt Gunn and his Ultra Adventures race company. Totally no big deal!! Right?? 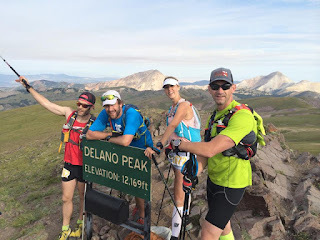 This is a first time event, AND it was part of the US Skyrunning series, so there was some real talent at this race, including Timmy Olsen, and local fast guys Mark Hammond and Dominick Layfield. But that also meant nobody knew how it would play out. Even on paper, it's a MONSTROUS race. It has peaks - it has waterfalls. When I first heard about it sometime last year I knew I'd want to give it a go. Peaks and Waterfalls! It's my theme for the year! The race started early - 5:00 AM. I didn't sleep great the night before, it always seems like the first night camping is not very good. After Matt told us he had $1000 dollars in each pocket for the male and female winners - we were off!! I was actually near the front of the group as we ran down a pretty steep hill and only vaguely thought to myself "Wow... this is NOT going to be fun running back up at the very end!" After a mile I was still in the top ten... so I slowed down. No need to hurry quite yet. People I knew started passing, Jason Eichorst, Craig Lloyd, and we kept moving until finally at the first real climb, some friends Nate Younger and Chris Erickson caught up to me. Nate and I stuck together for quite a while at the Bear last year, and Chris and I have done a couple awesome ridges (South Superior!) this year and he's had some awesome training. Great guys, so I ran with them for a bit. Nate saw a great photo op - so he took these fun pictures on the massive stone 'chairs' people had built. 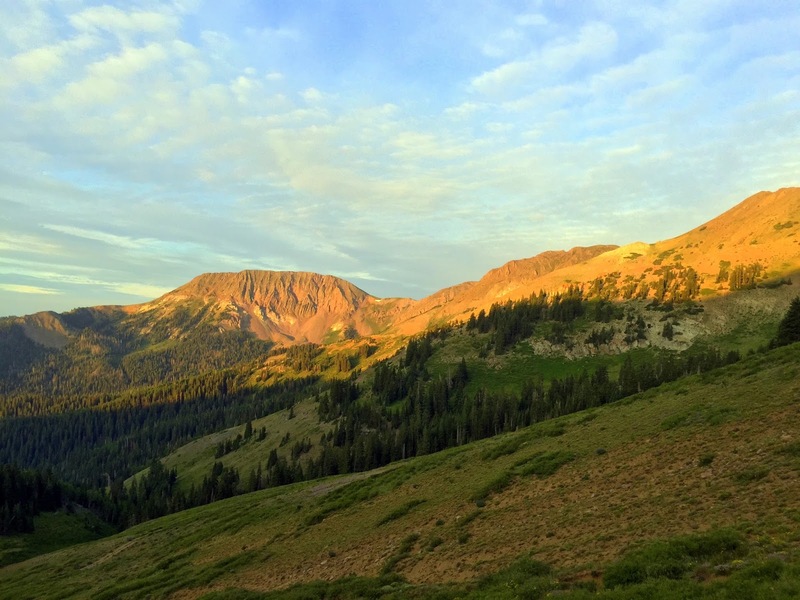 Pretty amazing campsites about five miles from the Ski Resort! We made our way towards the Alunite Ridge AS, and I kept slowing down on every climb. Just couldn't get moving. So Nate and Chris pretty much dropped me by the time we got to the aid station. I dropped my long sleeve shirt off, my headlamp, and started the hike up out of the Alunite Ridge Aid Station, but I couldn't move like I felt like I should. At the top of the ridge you start on a great single track down into a gorgeous valley, I spent too much time trying to figure out why my trekking poles wouldn't stay extended, and we were only like 8 miles in! So I was going to be carrying those for a LONG time now. The singletrack was gorgeous (you can see this same section as the picture above at about 0:28 into Ben's video below) and there were some really cool miner ruins all over that I would have LOVED to spend more time exploring. Joe Dean caught up to me here right where this picture was taken - I was having some weird pains in my right foot between the metatarsals that just pops up every now and again so I tried tightening my shoes to help contain the foot better, it didn't help a ton. Passed a cool waterfall below the trail that I ALSO would have loved to check out - but it WAS a race, so I had to keep moving. At the junctions where you weren't supposed to take a trail, there were good signs showing a big "WRONG WAY X" but just after crossing over the stream above the waterfall and turning away from the wrong trail, the course markings disappeared for a while. I kept moving because there REALLY wasn't anywhere else to go, but after about a half mile I asked the lady behind me if she had seen any course markings. "NO! And I was just about to say something to you!!" I loaded the GPX route I had on my watch and it looked like we were on the right course, so I suggested continuing, but after we still didn't see any markers, she turned around. I trusted the route Nate had created so I kept going and saw Joe up ahead a ways. "HEY JOE!!! Have you seen any markers?!" "NO! and we're starting to get worried up here!!" WHERE are the course markings?? There REALLY wasn't anywhere else to go, so we kept on moving and I finally found a marker down in the grass off to the side of where we were and hung it up higher on a tree - then saw another up ahead near where Joe and some other runners were. Looking back I saw the woman who had turned around, along with Chelsea Hathaway, Ben Light, and my brother Matt - who I HADN'T seen at the start so I wondered if he had made it out of his van! I was VERY happy to see them!! Even better - Ben made a sweet video of the race - the majority of which was right there at this point as we made the first really big climb up to the tallest point of the race, Mt. Delano. For some reason... I was into playing the air guitar with my trekking poles. The climb was brutal but took us up into an amazing tree-less meadow of flowers and greenery - and a very large flock of MOUNTAIN GOATS in the distance on what we think is Mount Holly. At the top of Delano the Van Horn Brothers were videoing and taking pictures - ALWAYS great to see them on a course! I looked forward to seeing them a few more times as well! We also saw the leaders of the Half Marathon hitting their halfway point, including Altra's Golden Harper and photographer (and runner) extraordinaire Derrick Lytle - Amazing guys. As we headed down from Delano Peak, Matt, Ben and Chelsea pulled away. I would be chasing Ben and Chelsea for most of the rest of the race! At the bottom of the descent from Delano the Half Marathon runners turned left down a road back to the start - and the rest of us crazies headed UP the road to the 2nd Aid Station, Mud Lake. That road was tough. My foot was hurting, my stomach was NOT feeling good, and my head just was NOT where it needed to be. I kept moving and finally made it to Mud Lake, where I got some tape to wrap around my foot (keeping it tight seems to help those aching areas between the bones) and used the compost toilet. I headed out and tried to catch back up to people that had gotten ahead of me because of my long time spent at the AS (including the front runners of the Marathon!) but as soon as I started climbing I couldn't keep it up. This would be a trend throughout the day. Slowly plod along uphill and blast the downhills... And I'm really not that bad of a climber, but I just couldn't keep motivated to push AT ALL up the hills. Shortly after Mud Lake we came through onto a gorgeous single track through a really pretty pine forest on a ridge with views on both sides that made me feel like I was in Zion looking down into deep canyons. But really I was just over 11,000 feet looking down to the normal elevations below. 50 yards later I came out of the trees onto a little overlook and stopped in my tracks, breathless, NOT from the altitude OR the running - but because of the stunning beauty and starkly varying terrain spread out below me. Scree, Pine Trees, Aspen, Lakes, Cliffs, Ridges, Fields... WOW. It was SO amazing that I DIDN'T EVEN TAKE A PICTURE!!! Not that it would have done it justice... Really it is similar to the above picture, but MORE. One of those things you can't really capture in a picture anyway. 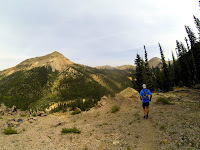 From there the single track became one of the most amazing trails I have EVER run on. Maybe it was because of the downhill, maybe it was because of the view that had stunned me shortly before, but WOW. Speechless. I moved fast and whooped and hollered and even passed a few people. I had a TON of energy until we came out of the woods to cross a large boulder scree field and I felt the vitality just disappear for a bit, very strange. Hiked behind another fellow for a while here and had my first startling experience that would happen a few more times in the race. Out of nowhere a BUZZING of hundreds of flies would sound in your ears as you'd come into the sound waves of flies hovering around SOMETHING (usually poo). I think that's the first time I've been startled by FLIES. HA. Leaving the scree field it turned into great trails again and across the way I saw Chelsea and Ben moving really well along the trail so I shouted a 'YEEHAW!!" or something to them and picked up the pace again. I didn't catch up to them but I DID catch up to Matt, who was starting to struggle a bit. I wasn't feeling like pushing anymore since I had caught up to company, so I hung with him for a while as we finished the awesome single track near Blue Lake on a very gravel-like road. A stream crossed it a few times so we dunked our heads and hats and continued along it - and it started to climb towards the next Aid Station, Bullion, where Matt told me he was going to be done. 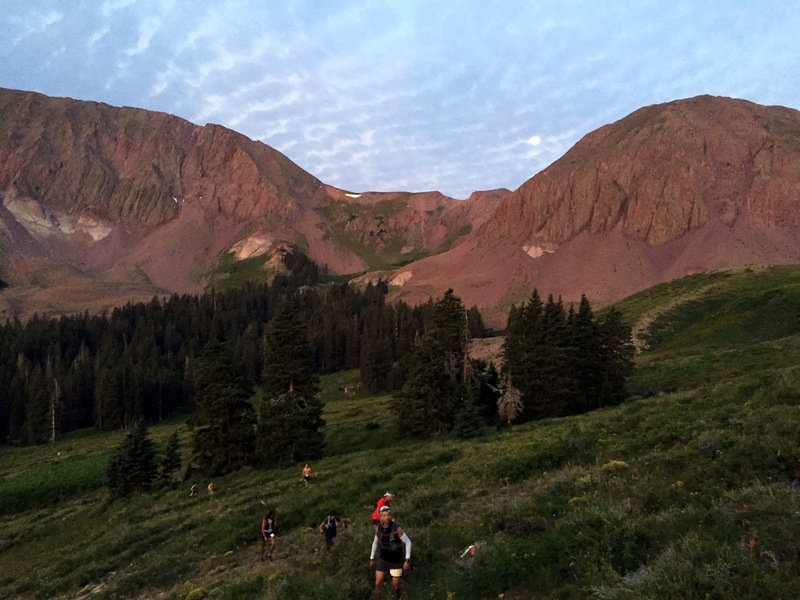 After his LONG LONG day at the Skyline 50 miler 3 weeks prior, he didn't want another 15+ hour day, and he was VERY happy with the gorgeous course and climbing he had already done. As we continued up the road I looked back and saw another friend Matt Clark catching up to us. Now I can be a fast runner... but I always laugh a bit when I see trail running friends who think I'm REALLY FAST and they say "Wait a minute?! What are you doing back here?" It was nice to have both Matt and Matt to plod ahead with - so that we did! Up up up up and UP. We came up and out of the road onto a more traveled road, the Paiute ATV trail where we saw Chelsea's husband Brent on an ATV taking off away from the Aid Station. I guess that means she'd been through! Go Chelsea! "WAIT! I wanted to snag a ride out of here with him!" said Matt. HA! There were friends at Bullion, I sat down for a bit and drank some soda, ate some potatoes, Joe was here and asked if I was ready to head out - I said I would be shortly! And he took off towards the Copper Belt Aid Station ahead of me. Matt Clark was ready to go when I was so we headed down the road together. I didn't mind running down the road, but I knew I wasn't going to be very happy coming back up it! It was very busy with ATVs, Jeeps, and Razors (or whatever those fancy richer-people dune-buggy or souped up golfcart toys that so many people have now are called!) kicking up dust. Matt and I had a nice conversation about travelling and my recent job-related woes which had caused me so much stress the past few weeks. 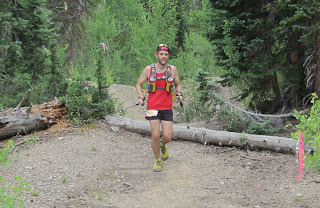 We also saw the leader Mark Hammond pass by, then another runner, then Timmy Olsen in 3rd place. 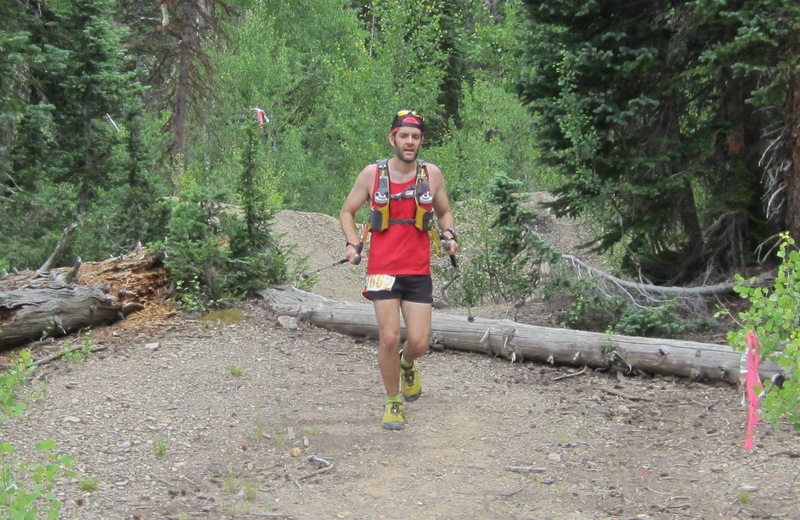 I think at this point I realized there really wasn't anything wrong with my body in this race. It was those demons I began this race report talking about sapping my mental ability to push and perform the way I was capable. Well. Fine then. I didn't have ANY reason NOT to continue other than these dumb mental issues that really I had started to overcome with a new job offer that was in process. I could do this. We made it down to the Copper Belt Aid station - seeing a few more of the leaders now about 10 miles ahead of us as they headed back to Bullion. I was happy to be getting to Copper Belt because I knew I had some awesome friends there volunteering. DJ, Sam, and EmmaLemma! This aid station is in the middle of an out and back from Bullion, with a REALLY MEAN climb up to another peak - Copper Belt Peak. 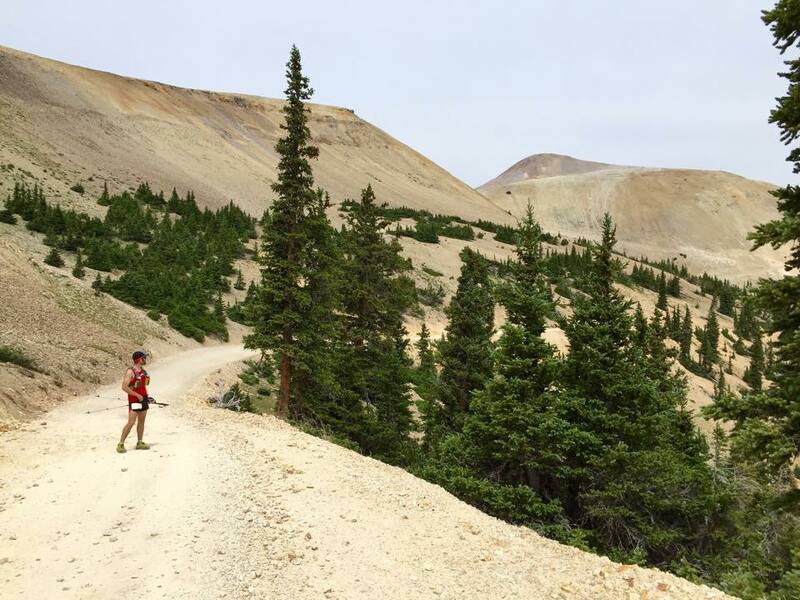 As I left the aid station with a cold Voltage Mtn Dew in my pack as a gift from Sam for the peak dew, I came upon the first place woman who was trucking along powerfully. "AWESOME - but a LOT MORE BRUTAL than expected. BRUTAL!" 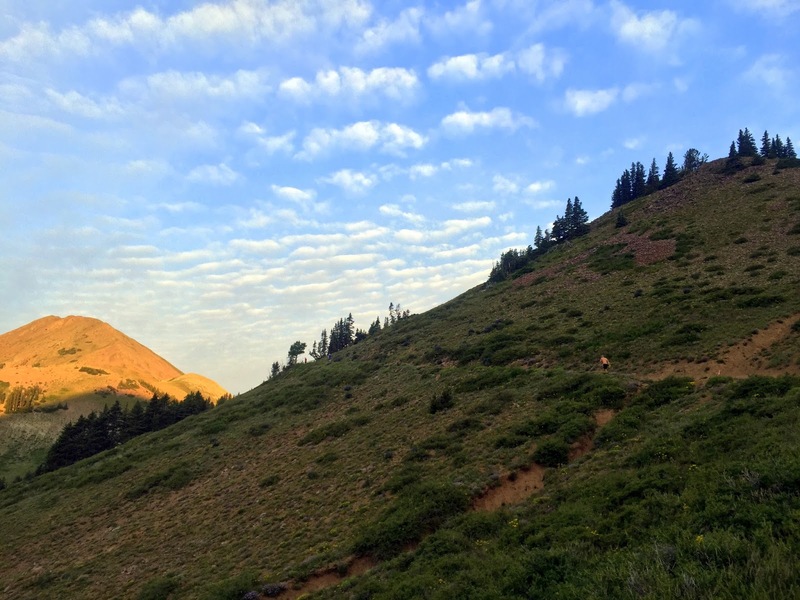 The trail crosses a creek, then heads up some steep grassy and rocky switchbacks until it gets to a massive scree field, with a decent trail cut across the steep mountain side. 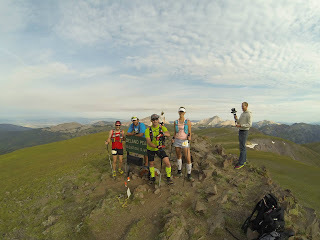 Here I saw a bunch of friendly faces as they came back down from the peak, Craig Lloyd, Nate Younger, Chris Erickson - all doing amazing! Near the Saddle just below the peak I came upon Matt and Peter VanHorn taking pictures and wishing it was less windy so they could fly the drone, so I gave them some trekking-pole air guitar action to help them feel better. Continued on up towards the peak where Davy Crockett came running (or careening it was awesome) and singing as he headed back down the hill, and ran into Chelsea and Ben who were also on their way back down. "Come and catch up to us!" Ben told me. I thought that I could do that, so I did! Side note - see the dog in the pictures there? That poor doggy was from the Bullion Aid station about 5 or 6 miles away! He had followed some runners and wasn't sure what to do! So Ben and Chelsea coaxed him into coming with them, found out where he belonged and delivered him to the worried owners! Isn't that great!? Matt and I continued up to the peak where Johnny Runner Maack was sitting on the peak where we had to punch our bibs with a hole-puncher as proof we'd been up there. Also - we took some pictures! Shocker! Copper Belt Peak = Mayurasana'd! Cuz that makes sense halfway through a 58 mile race, right?? 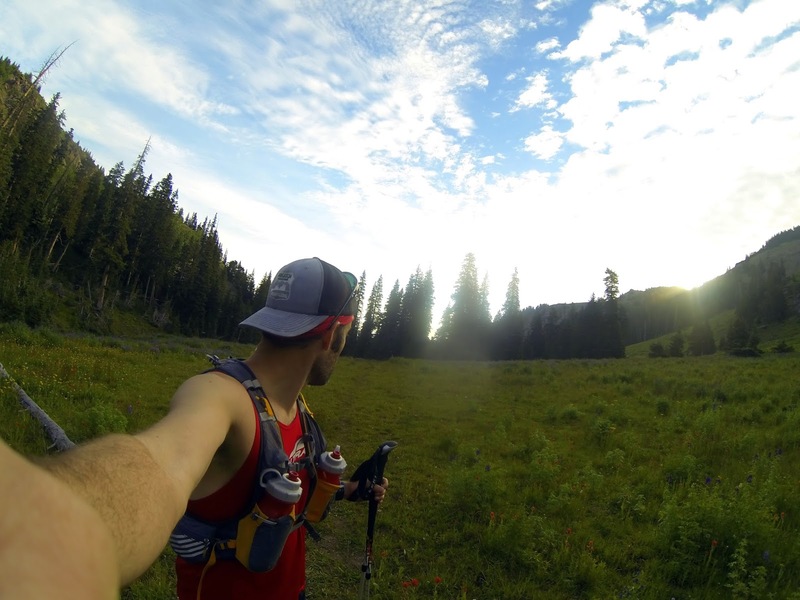 After crushing the Dew can and sticking it in my pack - I felt GREAT! So I flew down the hill until I saw my friend Adriana V so I skidded to a stop in the rocks and talked to her for a bit. Rough time, she was pretty sure there was NOBODY else in the race behind her. They had pulled a bunch of runners for not making cutoffs already. WHAT?!?! Wow!! Wishing her luck on the brutal climb up to Copper Belt I continued on. The Van Horns said, "If you wait a minute we'll get the drone up and film you running!!" The drone flew, I also flew, trying to catch up to Ben and Chelsea like I planned. I made it to the Copper Belt Aid station in good time - I was only FIVE MINUTES behind Chelsea and Ben! I might be able to catch them! 2nd time through CBP Aid Station - not as chipper! I was feeling pretty good so I started up the road. Uphill on this dirt road wasn't working. If I was having trouble on this 1000 foot climb in 3 miles - how the heck was I going to handle the 4000 foot climb over 4-5 miles just 10 miles from now?? It didn't help that there seemed to be even MORE vehicles kicking up dust as I slowly made my way up the hill. You can see the trails we used. As I got about a quarter mile away from Bullion, Joe caught back up to me. He was still planning on dropping, but it was nice to have company for a bit. At the Aid station my brother was still there along with Turd'l Miller, the operations master of the UltraAdventures races, and Brent was back to get Chelsea through her 2nd time. Chelsea and Ben had already taken off with Jennilyn cracking the whip to keep them moving. I knew I needed to chill and figure some things out so I replaced the wrapping on my foot. The Aid station didn't have any Mt. Dew but Brent did, so he brought be a dusty bottle. YUM! Matt grabbed me a cup of peaches as I drank about half the Mtn Dew as I discussed cutoff times with Turd'l. I downed the peaches, and chugged the rest of the Dew, hoping to get out of there and fly down the huge descent that was the next 7 miles. Hey! There was a WATERFALL down there and I wanted to see it. I drank that dew and slurped those peaches just a LITTLE too fast! Stood up and OH NO HERE IT COMES!!! In the 22 years prior to this event I'd only thrown up 2 times - both near the END of races. 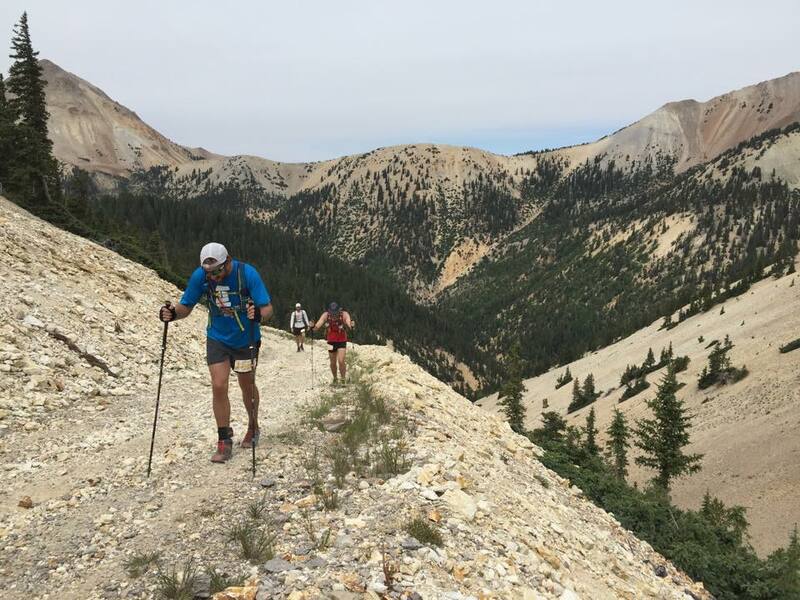 First time at the Dugway Isolation 50k after bonking on no food, and 2nd just last March less than a mile from the Buffalo Run 50 mile finish. This was both worse and not as bad as both of those times. "Puke and rally!" Matt said!! "Sip water and keep doing it as much as you can but don't do too much!" and he handed me some Wintergreen mints to help my stomach. Turd'l said "WHERE IS IT!? I want to take a picture!" But Jeff Stowell (who is an amazing human being) had already covered it up with dirt. 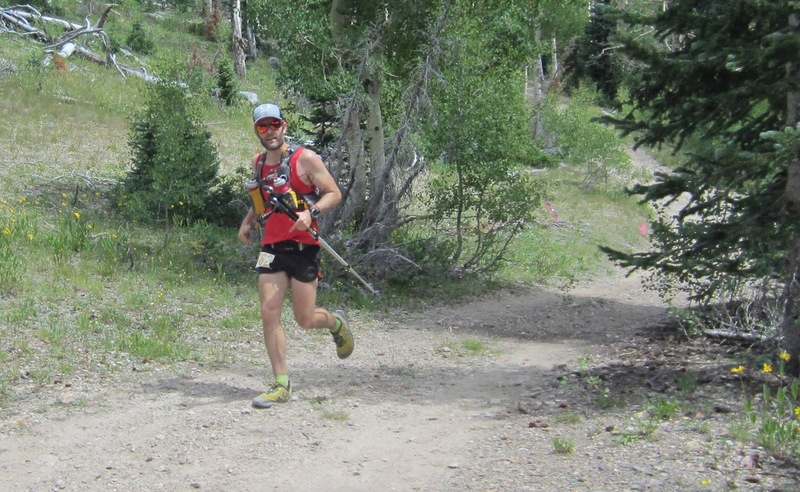 Matt Clark had caught back up and had headed off down the trail, as had Johnny Runner and his pacer Alec. I quickly passed Johnny on the downhill, and could see Matt ahead, but I couldn't maintain my normal downhill strength. I heard Brent's ATV ride off with Matt on the back and yelled at 'em as they headed to the start. I continued down faster than my uphill, but not by much. Still felt a bit queasy and weak so it was frustrating to not get moving. The views were pretty amazing as I headed down, down, down - and more and more cliffs appeared and I got excited for the rushing water and waterfalls I could hear down in the canyon! Still a bit frustrated by my inability to handle the steep downhill like I usually do, I finally could hear what I had been waiting for. I was going to jump under that waterfall and my race was going to IMPROVE dangit!! Hooray! There looks like there is a nice trail right next to it - that should head right to the Aid station! Wait a minute... Why am I heading away from the waterfall!? I was now off of a trail and on a dirt Jeep road again, heading AWAY from the waterfall, and towards a LOT of noise. There was a pretty cool spot for camper camping with about 30 people and rowdy kids playing in the river, playing games in a big circle, laughing and talking and eating! And there was me. Grumpily trudging down the road right next to their merry making. I headed BACK up a road just on the other side of their fun. Towards Miner's park. It was a lot farther up the road than I wanted it to be and I wasn't happy. I was definitely going to quit at Miners Park. Seriously. No point in continuing, this is DUMB. Why am I even out here??? There was a bunch of cool stuff in this area, I guess back in the boom times this little canyon was one of the most populous places in all of Utah! Finally I made it to the Aid Station. Sat down. Ate a REALLY good bacon cheese pita/quesadilla thing... Wow that was good. The AS Captain has a hunting falcon. It was beautiful. I should have taken a picture for my son Talon... but I was still not in the best mood. I drank a Mtn Dew from my drop bag. Slowly. Two more runners came in. I asked one of them "Is Johnny behind you guys?" He said "I AM Johnny"
I said "No, Sorry, I mean the OTHER Johnny!" I had met Johnny and Curt and Austin on Copper Belt Peak earlier. Austin and Curt I had followed on Instagram for a while so it was nice to meet them in person. Austin had started struggling and was a ways back. The other Johnny (aka Johnny Runner) came in with his pacer, and were ready to go before the rest of us were, so I headed out shortly after them. Seriously. I'm excited for this climb. This was the BEAST climb everybody had been dreading. But really, it wasn't THAT bad at first. Some decent climbs up some very grassy switchbacks that took Matt Gunn FOUR DAYS to clear with chain saws. A few switchbacks up I had a brilliant idea. HEY! I brought headphones. Maybe I should listen to some music! I don't normally listen to music while running. 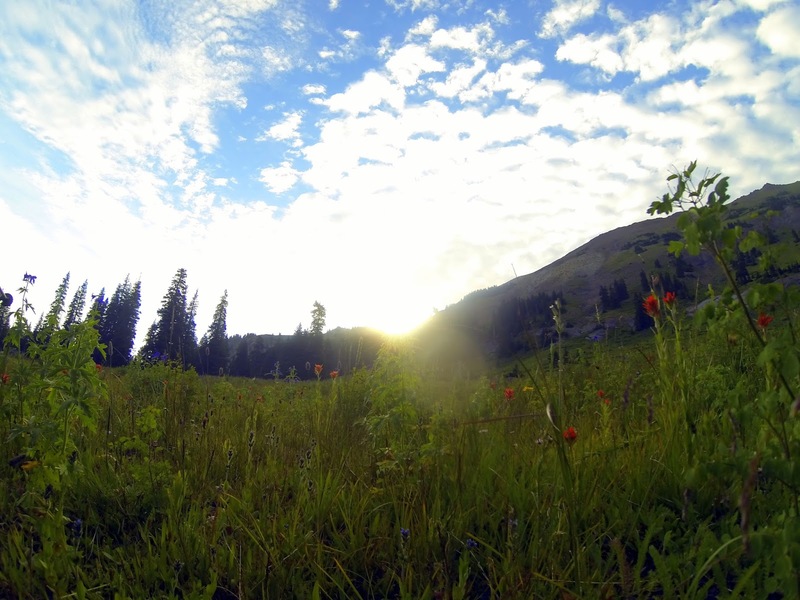 Usually the mountainous sounds are soothing and awesome. But 43 miles in those demons were not putting nice things into my head, so I needed to get out of it. MAN! I wish I'd done that sooner! When the music started I felt fine. I even started Dancersizing my way up the switchbacks! I was catching up to Johnny and Alec again! I was feeling great and MOVING! Then I saw Alec was cupping his hands around his mouth and yelling random things up the trail so I popped my headphones out. "What's up? Did you see something?" "YEAH! We just came around the corner of this switchback and there was a BEAR sitting in the middle of the trail!" DANG! Two times! First - I probably shouldn't have my headphones in right now if there are bears about, and second - I missed seeing a bear! And I was right near those guys! So we continued along making noise trying to make sure the bear wasn't around. 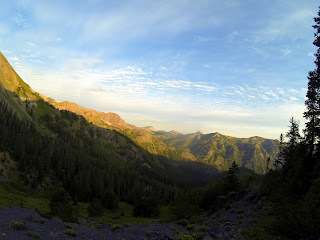 I did see Johnny and Curt coming up the switchbacks so I yelled at them to keep an eye out for a bear. I don't think they saw him either. Caught up to Johnny and Alec again and talked to them for a bit. Johnny is amazing. He is a leukemia survivor. He did Speedgoat ONE WEEK before THIS insane race! Definitely inspirational. 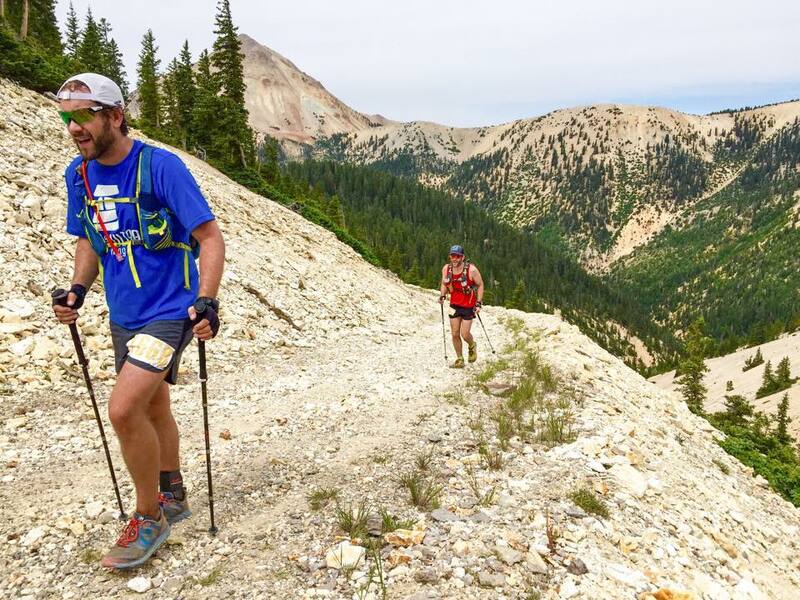 He also puts on an awesome race down in Corner Canyon that supports Cancer patients. Awesome. I was still feeling good with the music so I kept on going. Finally about ten switchbacks up - it got STEEP. But that was the last of those switchbacks! The road flattened out and I was able to run for a bit. Felt good to loosen up the legs and get MOVING a bit. Funny how even after all of this my body didn't feel that bad... I just couldn't get things to properly work together and keep moving! Stupid Demons. Causing problems. I can run for a bit!! Unfortunately... That didn't last too long. DOH! This part of the climb WAS gnarly. No trail. Just up. Up to Mount Edna (11,654 ft) the final peak of the race. Matt Clark is a teeny tiny dot. Teeny. Tiny. Way up there. At least this is Rocky Ridge-type stuff I still kind of enjoy. 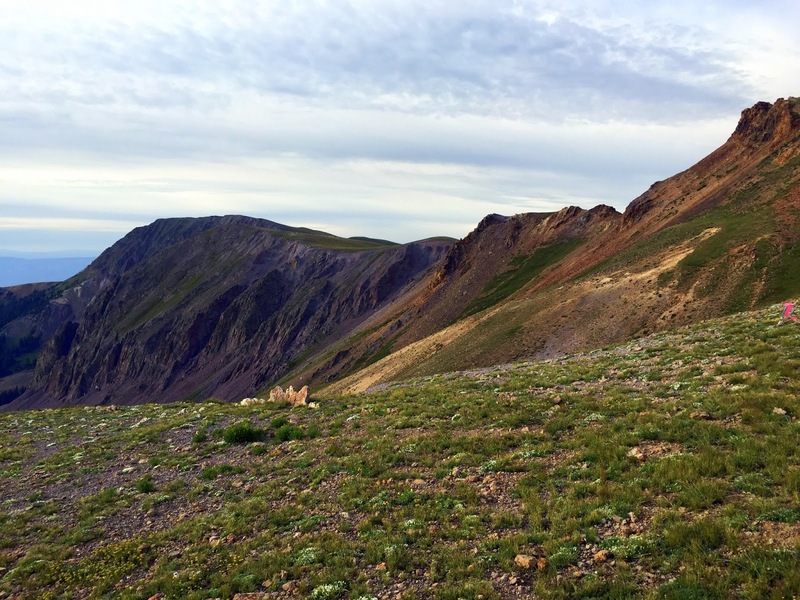 When we finally reached the top - we could see the Alunite Ridge Aid Station not too far away. But it was really... too far away. I was feeling really good on the downhills again - it was great to run fast in the deepening darkness. 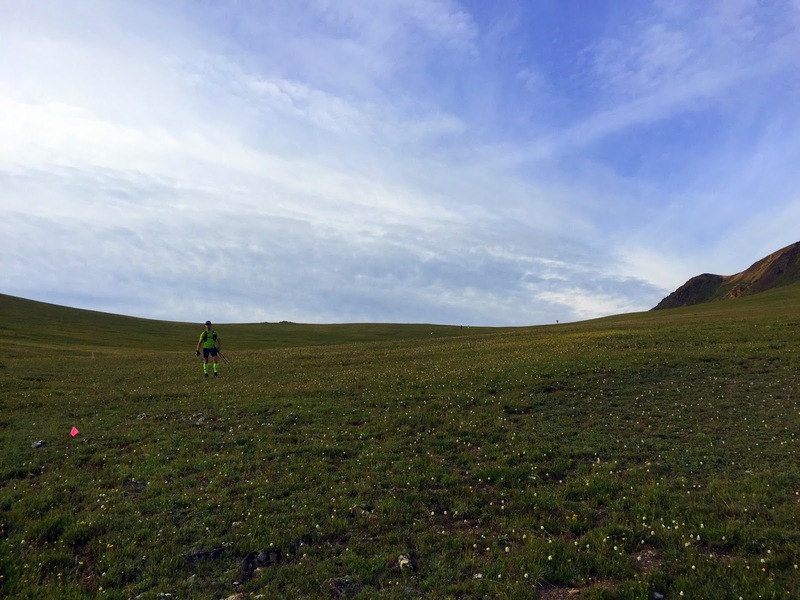 I ran down and around and down and around some more until somehow I was well BELOW the aid station and had to run BACK UP to it. I was really hoping to make it back to the Aid Station drop bags before it got too dark to see. I was about 3 minutes too late. It was dark. When I got there I asked who had been there just before me. Matt Clark. He was 18 minutes ahead. I grabbed my headlamp, drank my banana Core Power, talked to Johnny and Curt as they came in, and got out of there 4 minutes before the original cutoff of 9:30. I had 2.5 hours to go the final 8 miles. I could do this. But DANG was I slow. My phone was running out of batteries so I didn't have music, and I stayed slow. Johnny H and Curt caught up to me and we stuck together for a while. Johnny finally convinced himself that he REALLY wanted to see his wife who had come to see him finish, so he took off. Strong. I wanted to see my wife and kids too - they had been hanging around Eagle Point all day playing and waiting for me. Throughout the big climb I texted Kakes "Yeah I think it will be closer to 10" "Make that 10:30" "Umm... yeah.. maybe 11" Yikes. I was struggling. I felt great on the downhills, but every uphill, even slight ones, caused issues with my diaphragm. My body wanted to vomit on the uphills. It didn't. Finally we got back to the stone chairs about five miles from the finish. 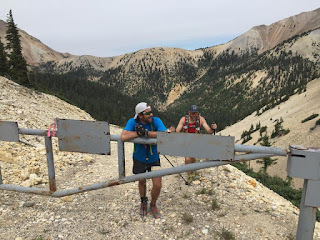 I sat on a log that was higher than the stone chairs and switched my little backup battery from my watch to my phone, Johnny Runner and Alec (pacer) caught up and we continued on together, with Johnny and Curt slowly breaking ahead of me. 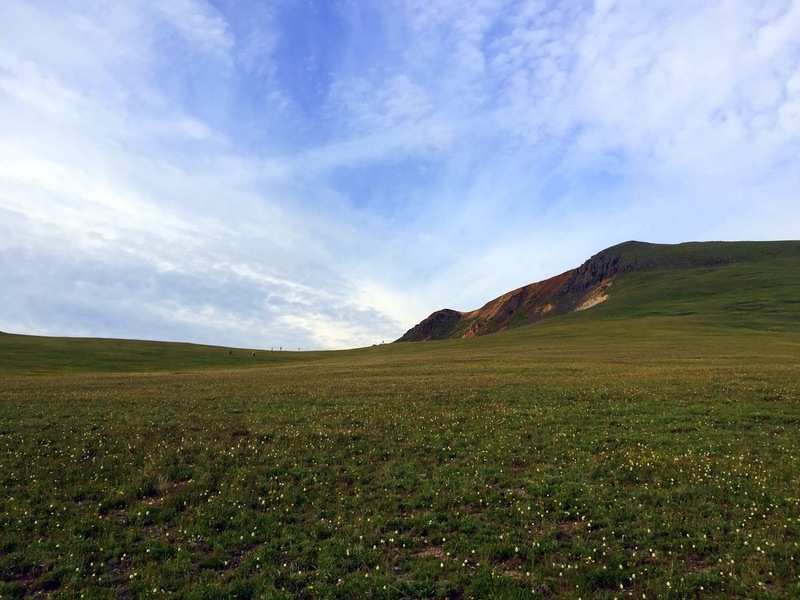 I kept stopping to lean on my poles and stretch and breath - after 18 hours the bottles in the front pockets of my pack were bruising my bottom ribs. Sore. Ouch. My feet hurt. So pretty normal for 18 hours in, huh? I put the music on and headed up the third to last climb, the last really MEAN climb, up to the ridge where earlier that day we had seen the sun come up. It was pitch black, and cloudy. Tiny lightning strikes were visible in the distance, and occasionally edges of the blood red moon would glare through the dark clouds like shining demons eyes. Sorry Demons. You aren't going to win. I trudged up the hill. 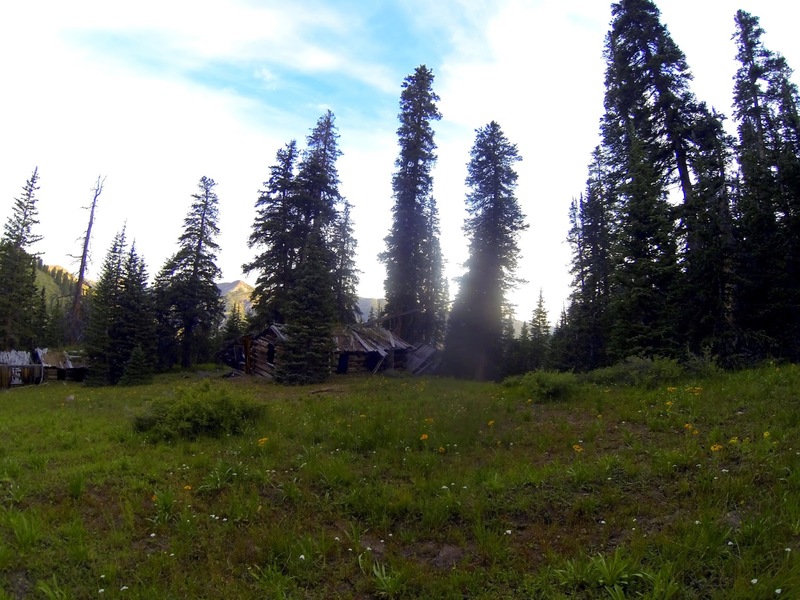 And BLASTED my way down the trail, knowing we were almost there. Deep breaths in through my nose deep into my belly, keeping the nauseau at bay. Listening to songs from Better than Ezra, Elvis, Gosti Iz Budushevo (Russian), and more - I didn't feel good, but I was strong. I passed Johnny M. and Curt and kept pounding ahead. Across the trail-less meadow with flags every hundred yards and into the trees where some vertical switchbacks I had forgotten about slowed me down. Curt caught up to me and stuck with me, even when I stopped and started puking. I told him to go ahead and Johnny Runner told me to take another Salt Pill and drink a lot of water. I did. I was almost out of water and all I had was Tailwind in my other bottle. It did a good job all day, but wasn't what I needed now. I continued up the hill. We had 20 minutes left to go about a mile. We were going to make it. Johnny and Curt were a ways ahead of me but as I crested the switchbacks, I knew I could run down this pretty technical trail back to the resort and the final MEAN but not that long hill up to the finish. I passed Johnny Runner and he cheered me on. That guy did SPEEDGOAT just last week! I'm in awe. So incredible. And STILL truckin! I caught up to Curt and we ran together until I just couldn't anymore. We arrived at the bottom of the hill and I could hear cheering as Johnny Hunt had arrived recently to the finish. Curt was a bit ahead of me up the hill and there were lights peering down. Somebody yelled "Is that AARON??" And I said "YES!!!!" and a cheer went up high above. I kept moving. I tried not to cry as I was emotional at the love and support from all the family and friends I had at the finish line. I also felt a bit bad for the many racers that didn't have that kind of support but who were STILL pushing through. I heard my wife "Yeah AARON!! You can do it babe!" I heard my brother Matt "This is the end - push on through!!" "NO I don't want to barf anymore!" But I pushed anyway. Finally - I was done. I fell into my wife's tight embrace and gave her a big kiss as I tried to turn off my headlamp to not blind anybody. Four minutes before the 'official' posted cutoff time. 18 hours and 56minutes, 93 Kilometers, a LOT of Vert! Johnny Runner finished 2 minutes behind me. Almost a full 19 hours on the course. Amazing. Sometimes... doing something hard and finishing it can be a way to conquer, to exorcise the demons. I think what I needed was just a bit more time on the trails to kick them out. I don't think we can or even SHOULD avoid some form of demons in our lives. 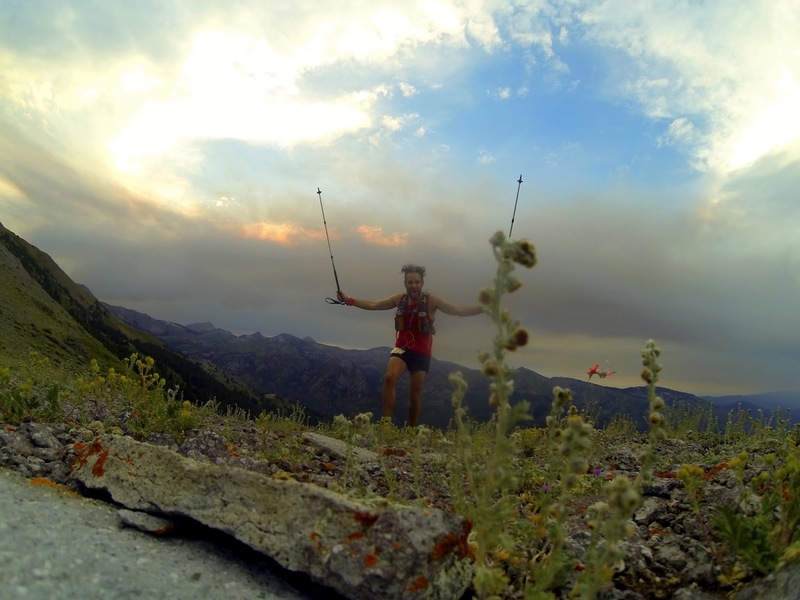 Some of them we can't just push through and conquer like you can in an Ultra race. But you can defeat them. And you will. Just keep on going. You'll be stronger. You will win. Thanks to all those who helped me get through both this race, and the demons that plagued me throughout. I have amazing family and friends. I wore the same Lone Peak 2.0's on this race that I wore at the Bear 100 last year... Great shoes. But I wonder if that's a coincidence? My Altra ambassador singlet was fantastic all day... the weather was perfect and I don't think I even burned much, which is abnormal.